We’d love your help. Let us know what’s wrong with this preview of Twilight by Erin Hunter. Erin Hunter's #1 nationally bestselling Warriors series continues in Warriors: The New Prophecy--now featuring fierce new art. The fifth book in this second series, Warriors: The New Prophecy #5: Twilight, brings more adventure, intrigue, and thrilling battles to the epic world of the warrior Clans. 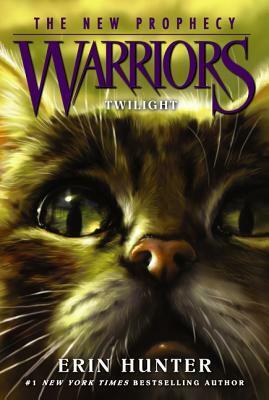 New territory brings new troubles for the fierce cats of the warrior Clans, Erin Hunter's #1 nationally bestselling Warriors series continues in Warriors: The New Prophecy--now featuring fierce new art. The fifth book in this second series, Warriors: The New Prophecy #5: Twilight, brings more adventure, intrigue, and thrilling battles to the epic world of the warrior Clans. New territory brings new troubles for the fierce cats of the warrior Clans, and former allies are acting strangely hostile. As divisions between the Clans grow deeper, Firestar's daughters face troubling decisions. The choices they make now could affect ThunderClan for generations to come...and with an unexpected enemy preparing to attack, their courage and strength will be needed more than ever if the Clan is to survive. To ask other readers questions about Twilight, please sign up. crowfeather is a very loyal cat why in the word does he love leafpool?!? Is crowfeather anyone elses fav? Rachel Crowfeather is not my favorite, but a close second. This review has been hidden because it contains spoilers. To view it, click here. " WARNING SPOILERS AHEAD! GO NO FURTHER IF YOU ARE NOT UP TO THIS POINT IN SERIES... unless you like reading ahead... because I love it!!! btw it seems long but read it any way please!!?!! Any way, who, here we are right, one book away from finishing the second saga of the Warriors series. Well we rejoin the new narrators of this saga. As you know, in the last saga Firestar was the narrator 100% of the time. Well in this saga the view switches between Brambleclaw, Squirrelflight, and occasionall " WARNING SPOILERS AHEAD! GO NO FURTHER IF YOU ARE NOT UP TO THIS POINT IN SERIES... unless you like reading ahead... because I love it!!! Basic synopsis: Unexpected rivalries arise against Thunderclan and a forbidden love threatens to rip the seems from Thunderclan's insides. An ominous promise foretells the death of a young cat and with looming danger of claws and teeth, how can the clans survive in this unknown place? This book follows Squirrelflight and Leafpool, each female cat dealing with her own secret issues. The love hinted between Leafpool and Crowfeather in the last book is expanded and the reader should expect the unexp Basic synopsis: Unexpected rivalries arise against Thunderclan and a forbidden love threatens to rip the seems from Thunderclan's insides. An ominous promise foretells the death of a young cat and with looming danger of claws and teeth, how can the clans survive in this unknown place? This book follows Squirrelflight and Leafpool, each female cat dealing with her own secret issues. The love hinted between Leafpool and Crowfeather in the last book is expanded and the reader should expect the unexpected while reading this book. Squirrelflight on the other hand develops a stronger relationship with Ashfur as Brambleclaw continues to lose favor in her sight. Thunderclan's least favorite clans ask for their help while the alliance they seemed to have with the other clan seems to shatter into pieces. It's hard to talk about this book without giving anything important away about the plot. This entire book is plot driven unlike several of the prior books so blogging about it is much harder than it has been. If you've been following along with the series, you won't want to miss this one. Least favorite part: The kits. Enough said. This review has been hidden because it contains spoilers. To view it, click here. This book was AMAZING! I loved all of the action and cliffhangers at the end of each chapter. But Cinderpelt was one of my favorite characters, why did she have to get killed by a badger? And she was so young, she had a long life ahead of her. But I'm glad Squirrelflight and Brambleclaw are finally starting to get along. I can't wait to see what's in the next and final book in The New Prophecy. Warriors-Twilight, is my favorite book ever written! It’s filled with action, conflict, and mystery… Squirrelflight is at war with herself trying to decide- Brambleclaw, or Ashfur? Her sister, Leafpool, a medicine cat, is in love with Crowfeather, a Windclan warrior. (Medicine cats aren’t supposed to fall in love, especially with cats from other clans!) Thunderclan is beginning to recover from their long journey, and Sorreltail will be the first queen to use the new nursery! As I said before, Twilight is my favorite book. I remember savoring every page of it I read and taking longer than usual to read it. (I can usually read a warriors book in a day or two if I read quickly) I think Leafpool should’ve spent more time with Crowfeather than she did or Erin could have let us read one of their meetings from her perspective, other than having Squirrelflight stalk her. Otherwise, this book is fabulous!! I’m going to end up reading this over, and over, and over! I think Squirrelflight is my favorite character in this book, because she is able to defend herself from other cats’ accusations and insults, (usually with a fiery retort) she is loyal to her clan, and she has an interesting personality. I like all of the characters, I just find Squirrelflight the most entertaining out of all of them. The theme of this book is to follow your heart. Spottedleaf told Leafpool to follow her heart and make the decision she wanted about Crowfeather. “No cat can make this choice for you,” Spottedleaf replied, letting the tip of her tail brush against Leafpool’s shoulder. “Deep inside, you know what is right, and you must follow your heart.” Leafpool had run from Cinderpelt, who had accused her of treachery for loving Crowfeather, and had come to the Moonpool, and was met by Spottedleaf, who gave her that message. When Leafpool returns to Thunderclan to save her clanmates, who are in danger Crowfeather tells her that he knew she loved him, but not enough to give everything up for him. This book was sad, yet amazing. The continuing conflict between Brambleclaw and Squirrelflight killed me, too. I was hoping their issues would be resolved soon, but the chasm only grew :( I'm hoping it's resolved in the final book of the series! I also don't like where Brambleclaw's character is going - he was such a strong, honorable cat in the beginning of the series; to see him succumbing to ambition like his father is so hard. I hope he sees sense soon as well! (view spoiler)[Cinderpelt. I AM NOT OKAY. Her death was almost as rough as Bluestar's and Yellowfang's! I was legit sobbing, I can't deal man. I CAN'T. My heart is broken. Los gatos guerreros se intentan seguir adaptando a la vida en el nuevo bosque, pero los gatos del Clan del Viento comienzan a mostrar hostilidad hacia los del Clan del Trueno, aun cuando ellos los habían ayudado cuando tuvieron problemas de liderazgo en su clan. Por otra parte, sigue habiendo mucha distancia entre Esquiruela y Zarzoso, aunque ninguno de los dos la desee. Para añadirle problemas a los clanes, sigue su curso el amor entre Corvino Plumoso y Hojarasca Acuática, incluso siendo ella curandera y ambos de clanes diferentes. La historia narrada por Erin Hunter sigue siendo dinámica, rápida y fácil de leer, atractiva para todo público. Se repiten en la historia ciertos patrones que ya se dieron en la saga anterior, como lo es el amor prohibido entre clanes o el hecho de que se tengan que unir los clanes para hacer frente a un enemigo mayor. Pero como los personajes van cambiando, rotando, la historia de todos modos cambia, las tensiones son distintas y logramos conocer el carácter de distintos gatos. Continuaré con el siguiente libro, donde se le da un desenlace a esta saga. A cunning plot is in motion where the spirit of Tigerstar is influencing his sons, Brambleclaw and Hawkfrost for the bad. Brambleclaw is more than a little credulous. The Erins do keep reiterating the obvious at times. Can be annoying. A story thread continues that compares faith to lack of faith (and, in one instance, blind faith on the part of Firestar) that lasts the rest of this series. My main complaint at this point is that the books end in a way that doesn't properly seem 'finished', espe A cunning plot is in motion where the spirit of Tigerstar is influencing his sons, Brambleclaw and Hawkfrost for the bad. Brambleclaw is more than a little credulous. The Erins do keep reiterating the obvious at times. Can be annoying. This book is full of suspense it is when the clans have settled into their new home but not easily. the four clans have found new territories but have had some arguments. Will there be more trouble? It was filled with plot twists, adventure, and mystery. I loved this book and was had so much fun reading it and I can't wait to read the next one. If you like adventure, and mystery you would love this book! forgot how brutal this one was. je-sus. Simplemente no me lo puedo creer!!! This is the 5th book in the second series about the 4 Clans of Cats; Warriors the New Prophecy. Once again it was okay. I am finding myself just wanting to be done with these books so I can move onto something better. I think this book can aptly be described as a teenage soap opera where all of the teenagers are cats. This book deals with the cats settling into their new territories and trying to find a Moonstone so that the medicine cats can communicate with the Star Clan. All the medicine cats This is the 5th book in the second series about the 4 Clans of Cats; Warriors the New Prophecy. Once again it was okay. I am finding myself just wanting to be done with these books so I can move onto something better. I think this book can aptly be described as a teenage soap opera where all of the teenagers are cats. This book deals with the cats settling into their new territories and trying to find a Moonstone so that the medicine cats can communicate with the Star Clan. All the medicine cats are still dreaming of something horrible that will happen to the clan. Most of this story revolves around Leafpaw. Although Brambleclaw, Squirrelflight, and Crowfeather also take center stage at times. As with the last couple books the whole book is spent setting up a major action scene that takes place in the last few chapters of the book; once again a very specific formula is followed in writing this book. If cats could star in a teenage soap opera you would get this book. It's all about who loves who, who is mad at who, who is apprenticed to who, etc. etc The cats are entering their teenage years (I guess) and all of the sudden all of the great characters from the beginning of the series are getting very unreasonable and temperamental. I honestly did not like any of the main characters in this book; they all needed to be scruffed and shook a bit to help them reason better. I am hoping that this degradation of characters in all of the cats is leading to something interesting...but whatever it is leading to it's not happening in this book. Soooo...hopefully something will happen in the 6th (and final) book. I completed this one in fairly short order this weekend, mostly on Sunday when I was letting my back recuperate after helping move some friends into their new apartment on Saturday. I surely did need the downtime! Anyway, this book is the 5th of this second series of books about a large group of anthropomorphic cats living in the wild, divided into four clans, and experiencing the harsh realities of life. This book in my mind is a bit of a filler before the 6th and final book of this series. It I completed this one in fairly short order this weekend, mostly on Sunday when I was letting my back recuperate after helping move some friends into their new apartment on Saturday. I surely did need the downtime! Anyway, this book is the 5th of this second series of books about a large group of anthropomorphic cats living in the wild, divided into four clans, and experiencing the harsh realities of life. This book in my mind is a bit of a filler before the 6th and final book of this series. It serves to nail down the lives of the clans in their new home and to come to grips with the new, necessary politics of how the clans will deal with each other. Most of the subplots deal with individual issues among the more prominant members of Thunderclan, including two cats from different clans torn between their love for each other and their duties to their clans. Sort of a Romeo and Juliet situation. Two other young cats continue their digression away from love only to realize in the end they truly do love each other. Lots of soap opera like mini plots here. The obligatory action this go round deals with an invasion of badgers that are after their homeland once again, having been chased off when the clans first moved in a couple of books ago. These books, in general are very good books for younger teenagers, say 10-15. This particular book is a bit week on plot in my opinion but does a good job of delving into the more emotional aspects of the upheaval that all the cats have recently experienced. I have a lot of confidence that book number 6 will be the climax I have come to expect from this series. Judging from that one I will decide if I will read the the third set of 6 books, already published. There are new troubles for the fierce cats of the warrior Clans. Dangers they have never faced, and should never have to face again, are lurking in the shadows, the Twilight shadows. Allies of the past are acting strangely hostile. Now that divisions between the Clans grow deeper, Firestar's daughters face troubling decisions. The choices they make could affect ThunderClan for generations to come. With an unexpected enemy preparing to attack, their courage and strength will be needed more then There are new troubles for the fierce cats of the warrior Clans. Dangers they have never faced, and should never have to face again, are lurking in the shadows, the Twilight shadows. Allies of the past are acting strangely hostile. Now that divisions between the Clans grow deeper, Firestar's daughters face troubling decisions. The choices they make could affect ThunderClan for generations to come. With an unexpected enemy preparing to attack, their courage and strength will be needed more then ever if ThunderClan is to survive. Some of the feelings, especially from Crowfeather, are the same, or very similar, to the feelings in Moonrise. Moonrise is the second Warriors book in this series. This text-to-text connection, unlike most, helps the characters in the book better understand things, instead of helping the reader. Yet in a way it helps the reader too because it helps make the story better. Estoy debatiéndome en la calificación que debo dar a este libro. Creo que le dejaré en 4.5, porque es mejor que Aurora, Luz estelar y está más o menos a la altura de Medianoche y Claro de Luna. Bueno, pues...... este libro me destrozó. Desde el principio con ese prólogo ya me esperaba que algo malo iba a pasar y pues sucedió y me golpearon matando al personaje que más me gustaba. Es un muy buen libro, la manera de escribir de las autoras sigue siendo muy buena, incluso en inglés con todos los nombre Estoy debatiéndome en la calificación que debo dar a este libro. Es un muy buen libro, la manera de escribir de las autoras sigue siendo muy buena, incluso en inglés con todos los nombres confusos de gatos resulta ser sencillo entender la pluma de las autoras. Los aspectos que no me gustaron de este libro fue el hecho de que sentí que los personajes eran algo molestos en ocasiones y sentía que en un momento eran felices y al otro tristes o se enojaban. Los personajes tienen las personalidades bien desarrolladas, sin embargo me gustaría que actuaran con algo más de coherencia y que dejaran de darle vueltas al mismo asunto tantas veces. Incluso me llegaron a molestar esas pequeñas tramas que en mi parecer resultaban innecesarias. En fin, una quinta parte que siento que recupera más el ritmo que llevábamos antes, tiene tramas innecesarias, sí, pero bien desarrolladas y no es tan aburrido como los dos anteriores. In this installment of the Warriors series, Leafpool falls in love with Crowfeather. This is a taboo relationship for two reasons: Crowfeather is a WindClan cat, and Leafpool is a medicine cat. There's just nothing right about it! Another twist: Crowfeather had once been in love with the RiverClan cat, Feathertail. I still absolutely love the pairing. By this point in the series, and even in the following books, the warrior code gets dishonoured over and over and over, until the point that it's faded to almost nonexistence. That's one thing that irks me throughout the series. This book is a continuation of the warriors new prophecy series. It goes to the point of Firestar's daughters. Firestar is the leader Thunderclan and his daughters are having trouble. Both are falling in love and coming into the troubles that come with it plus ones that are rather stupid. Also near the end, a huge threat approaches killing multiple of the Thunderclan cats. This book is written from the point of two cats, switching off every 1 or 2 chapters. Honestly, it is not as good as the r This book is a continuation of the warriors new prophecy series. It goes to the point of Firestar's daughters. Firestar is the leader Thunderclan and his daughters are having trouble. Both are falling in love and coming into the troubles that come with it plus ones that are rather stupid. Also near the end, a huge threat approaches killing multiple of the Thunderclan cats. This book is written from the point of two cats, switching off every 1 or 2 chapters. Honestly, it is not as good as the rest of the books in the series so far. It makes you angry at the stupidity of what the cats do. Other than that it is a good continuation of a good series. Technically 3.5 stars, but I refuse to give four because the relationships were all so forced. Much better than the previous few. This one had good pace and some really good ideas such as the difficulty with the clans helping one another. The kitty romance would have worked better had I believed either of these characters really cared about each other beyond the fact that the authors told me so. I'm also disappointed to be denied Brambleclaw's perspective, but I suspect that will be the next book Technically 3.5 stars, but I refuse to give four because the relationships were all so forced. In the story they are finally starting to settle in to their new home around the lake but there are still a lot of issues.Thunder clan is struggling with the lack of apprentices.badgers attacked their camp and killed their warriors. Leaf pool is one of the clans Medicean cats but she is love with a cat from wind clan. I would recommend this story to any one who likes stories with a little bit of everything because it's a good book to read. I flew through this book unbelievably fast. 3hr to read. It was pretty good! But the only thing that frustrated me was the (view spoiler)[dramatic relationships. I mean seriously, Leafpool runs away with Crowfeather?! And Squirrelflight just has to get over herself and stop hating on Brambleclaw because her denial's through the roof. (hide spoiler)] Also, another main death in this book :( I'm so sad. Will be reading the next one in a few days. “[Leafpool] waved her tail in greeting as she padded past Cloudtail and Daisy; as she left the clearing she heard Cloudtail meowing, "This time try to pretend I'm a badger and I'm going to eat your kits."